Add these helpful tools to your wish list! Improve your finish game with CRB’s new DCRDS Variable Speed Rod Dryer. Bringing a variable speed controlled by the user, this dryer offers flexibility to rod builders of all skill levels. This new RDS units brings a durable, user-friendly drying unit that gives the builder total control when needed most. Each unit features a DC motor with a built-in converter that handles both 110v or 240v. This means there is no need for a separate unit if you’re an international builder. You can dial this dryer in from a virtual standstill all the way up to 45 RPM. Plus, the DCRDS comes with a 3′ cord, form fitting chuck, and one Dryer Support Stand, to give you an improved drying system. In addition to the variable speed, CRB has also added a Rod Dryer with Clutch model. This dryer features a clutch that gives users the ability to quickly grab the rod, which then halts the rod’s rotation and allows builders to apply epoxy with the ultimate precision. 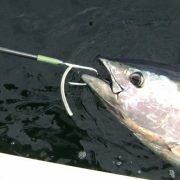 While some prefer to control the speed for sharper epoxy edges, others find the ability to stop the rod gives the final epoxy a smooth and precise finish. 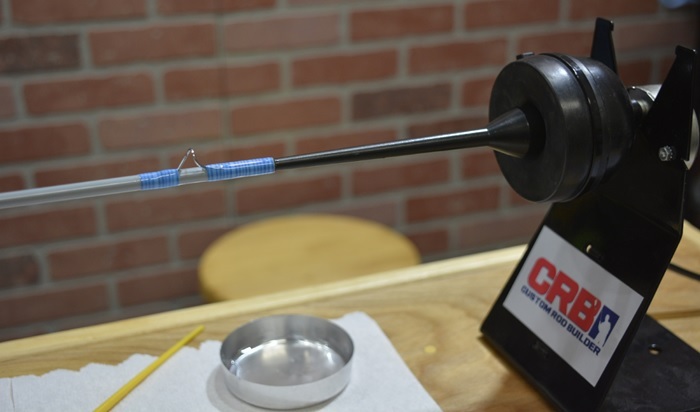 For touch-ups and pinpoint accuracy when applying epoxy, this CRB Rod Dryer with Clutch makes for the perfect upgrade to your rod building system. As the cold weather causes temperatures in your workshop to plummet, your epoxy supplies will also take a serious hit. Hardening and sometimes even crystalizing, epoxy resins can become too viscous and unusable. 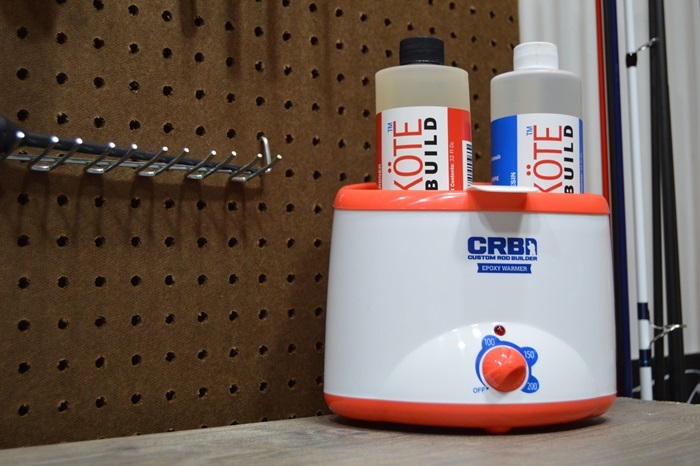 Rather than let your supply suffer, use the CRB Epoxy Bottle Warmer to revive your epoxy finish. By re-liquifying crystalized epoxy resin, this handy epoxy warmer saves your supplies and makes epoxy easier to work with. With two bottle holders to warm the epoxy’s resin and hardener, you can use it to decrease the viscosity of both components. By preserving and increasing the flowing properties epoxy, the CRB Epoxy Bottle Warmer makes mixing and applying epoxy much easier even in the dead of winter. And read more about Controlling Your Curing Conditions in our blog! 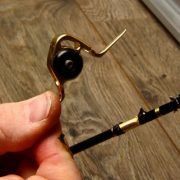 Although fishing with a multi-piece rod doesn’t feel any more difficult than using a one-piece rod, there are some added aspects of building a multi-piece rod that can get tricky. 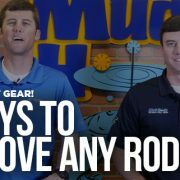 Since a complete multi-piece rod becomes quite long, it makes wrapping and finishing the assembled rod much more challenging. 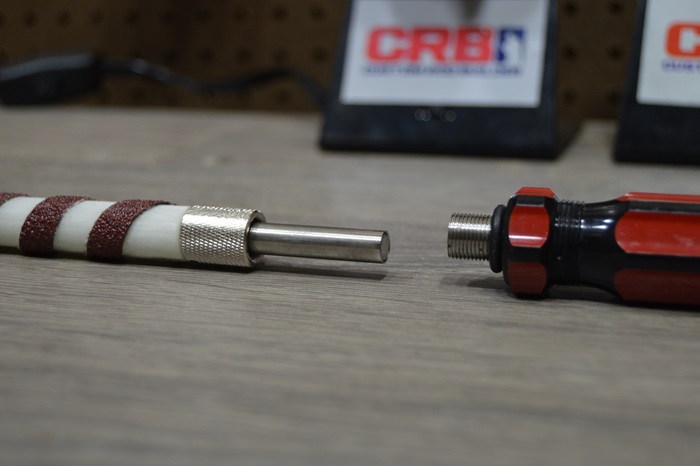 Whether wrapping the ferrules or finishing a segment of the multi-piece fishing rod, the CRB Blank Extension Tool is the perfect asset to help you overcome these custom rod building challenges. The idea of ferrule wraps is rather simple however, the completion is a bit more complicated. Considering it works best to center the wrap on a rod blank, it’s difficult to do this when lacking the adequate length to work. In the past, this made ferrule wraps a real pain, but now with the CRB Blank Extension Tool, ferrule wraps are easier than ever. All you need to do is insert the tool into the rod segment you are working on, set it in your CRB stand, and use it as a sturdy wrapping aid for perfect ferrule wraps every time. The CRB Blank Extension Tool’s tapered design works to easily accommodate any rod blank with an inside diameter between .20” and .35”. 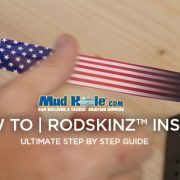 This allows you to fit each section of the multi-piece rod onto the CRB Blank Extension Tool and then precisely work on wrapping and finishing its guides. Grab a Blank Extension Tool to make building multi-piece rods a breeze! 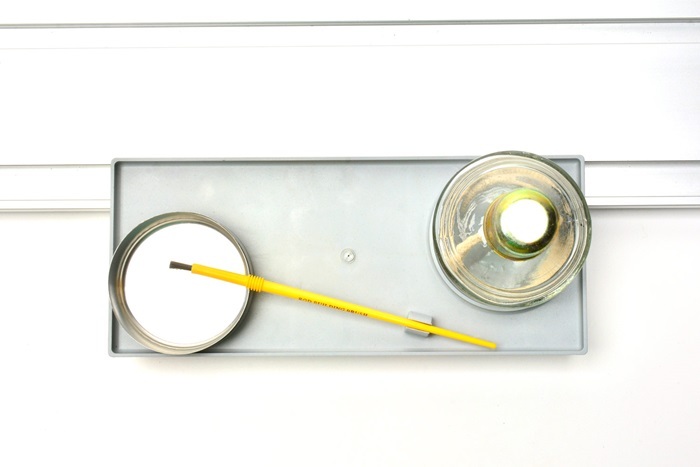 Have you ever misplaced your epoxy brush or placed your elbow into a forgotten dish of epoxy? 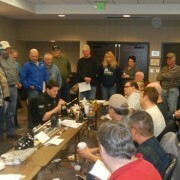 Don’t feel embarrassed because it happens to old and new rod builders alike. CRB felt rod builder’s pain and created the RBS Rolling Tool Tray and Rolling Finish Tray to keep your rod building supplies handy. No matter if you need to burnish a thread wrap or apply epoxy, these rolling trays move along the track to keep your tools and supplies in immediate reach at a moment’s notice. 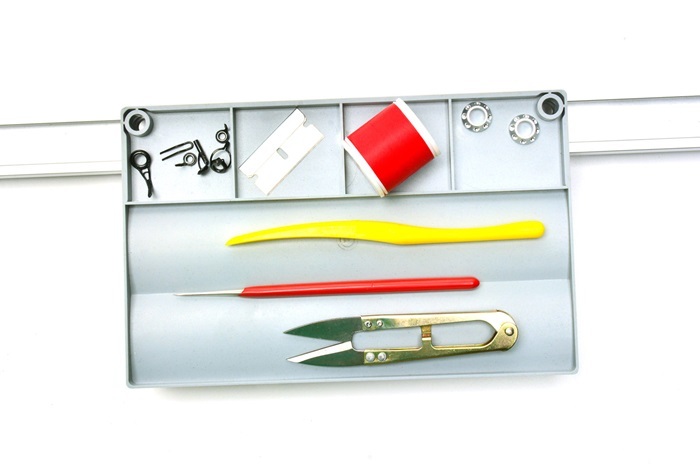 Easy to install yet hard to live without, RBS Rolling Trays will subtly reform your RBS work station by clearing clutter and keeping your tools as well as your materials organized. Keep everything in hands reach with the RBS Rolling Tool Tray and Rolling Finish Tray. 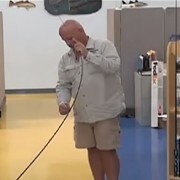 Reaming is one of the basic steps to building every fishing rod, yet not everyone has the right tools to ream successfully. The CRB Extreme Reamer Set features 4 reamers with different outside diameters to fit any rod blank. The extreme reamer is the greatest commercial reamer available because of it’s design, durability, and functionality. These versatile solid glass reamers are designed to work as a hand reamer for the delicate work or to be chucked up in your drill for jobs requiring a more heavy-duty approach. All Reamers come standard with 50 Grit abrasive. This and the 32 grit abrasive tape are available in 25 foot replacement rolls. 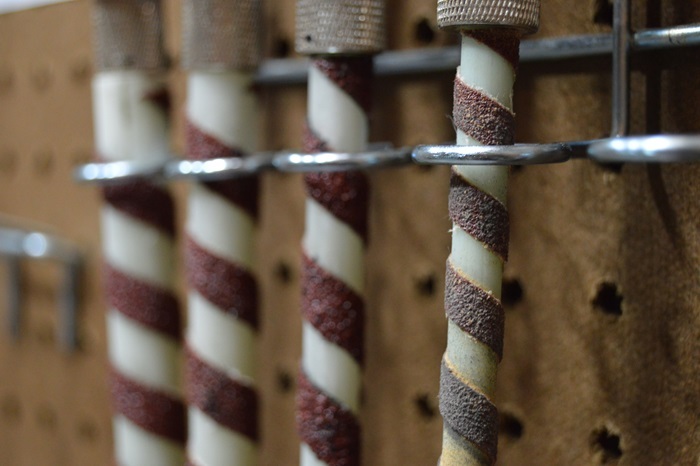 CRB works tirelessly to develop innovative solutions for every custom rod builder. 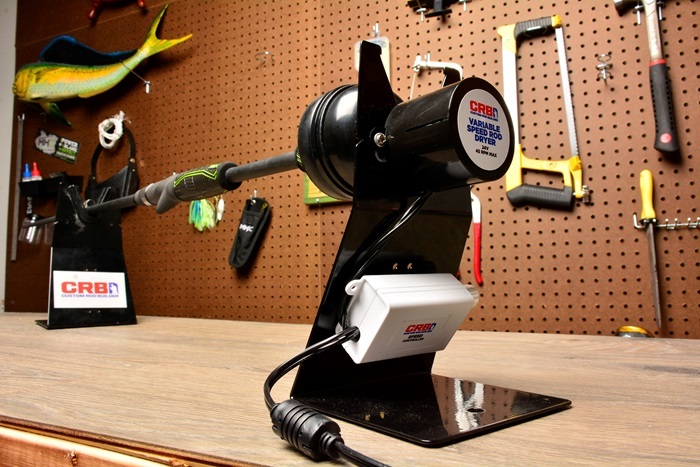 From grip and reel seats to tools and equipment, CRB has a high quality yet affordable option perfect for any builder. In rod building, you can do it all with CRB, so assemble the perfect system for your home or business now. See more from CRB at Mud Hole!